Ripple Thoughts: Give it a try on my cupcakes! 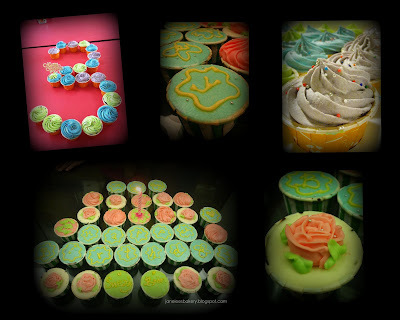 Another cupcake project for my beloved brother and sister-in-law's birthday. Piping roses was my first try, I have watched a few tutorial video clips in Youtube, pick up some ideas of piping it. Challenging was that I have to pipe very quickly before creamcheese gets too creamy, there were a few rejected ones though, in this reason, I need to store piping bag back to fridge for chilling. Get back to work after 10 minutes again. Another technique to deco cupcakes. I would love to use creamcheese instead of icing sugar, many of my relatives and friends prefer creamcheese too, they ain't too sweet, and it goes so well with chocolate cupcakes. Perhaps, give it a try next time if you think of buying a cake, try cupcakes!